"Homemade vanilla ice cream full of creamy vanilla flavor! An easy recipe with simple ingredients and no eggs required!" Vanilla-nilla-nillaaaaa! I seriously don’t know anyone who doesn’t like vanilla ice cream? Do you?? What’s not to love? It’s boss all by itself yet the perfect base for EVERY flavor under the sun. Vanilla wins! Ok, so maybe vanilla ice cream isn’t as high on my list as chocolate salted caramel pretzel (mercy), but I MUST have vanilla ice cream with all of my cakes! I’m sure you’ve probably noticed that huh? 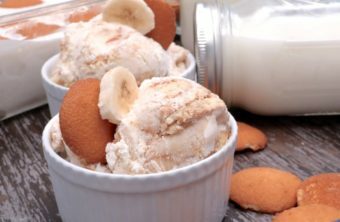 Today I’m going to share with you one of my favorite homemade vanilla ice cream recipes! Like all homemade vanilla ice cream recipes, it’s pretty basic, but that’s the beauty of it. It’s so darn simple and creates such a sweet, creamy, pure and… vanilla-ry. (totally a word btw)ice cream. This homemade vanilla ice cream doesn’t have any eggs to fool with which is why I love it! My attempts at egg yolk ice creams are always hit or miss. Sometimes they taste too eggy; sometimes it gets those tiny ice balls. Now and then though, it comes out like pure, freakin ice cream heaven. Aint nobody got time to have their emotions played with like that! I stick with eggless version around these parts. 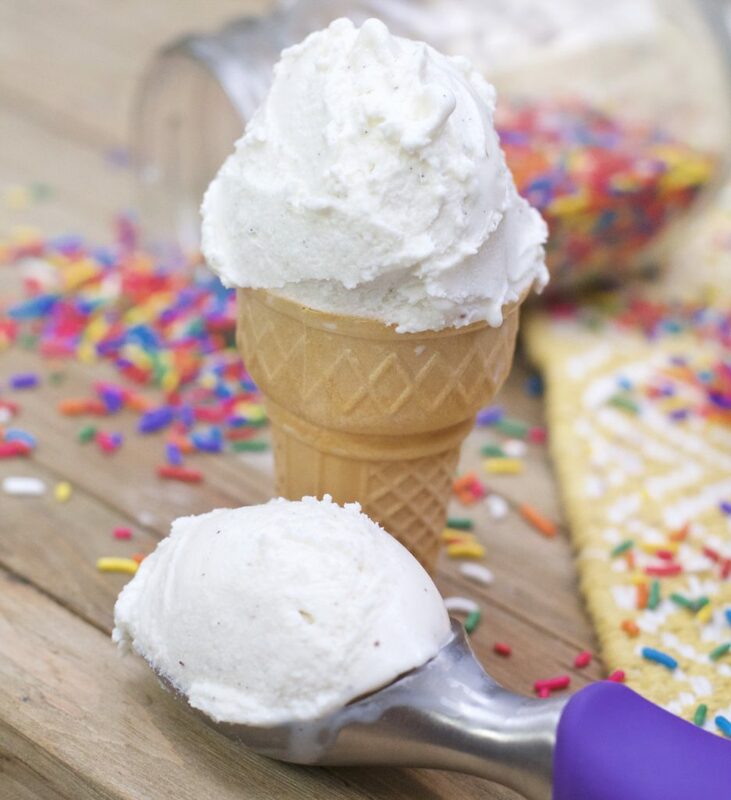 Eggless version or Philadelphia-style, ice cream is bae! They always come out so perfect for me. A bit softer than standard store-bought, egg-included ice creams, but still amazing! 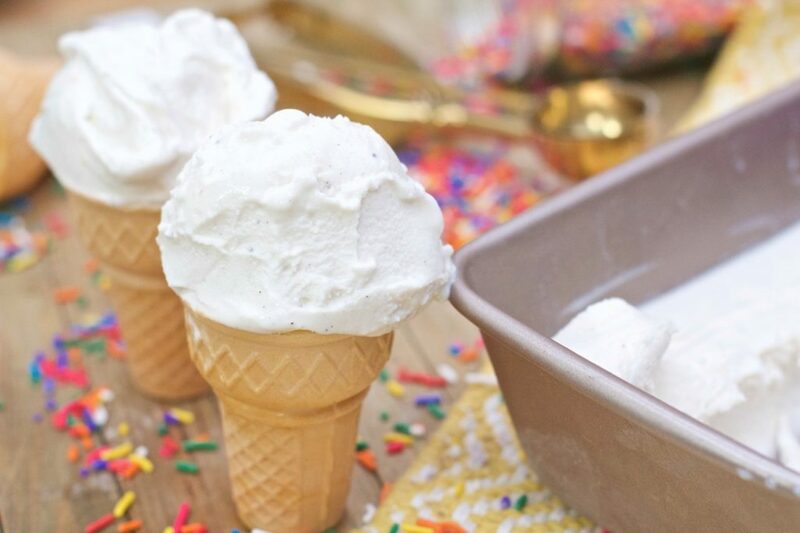 This homemade vanilla ice cream is perfect for add-ins! Throw in some Oreos for cookies and cream, strawberries, cream cheese and graham crackers for cheesecake flavor, or swirl in some fudge for fudge ripple! I scoop out balls of this ice cream and freeze them on a cookie tray. Then I wrap them individually in plastic wrap so I’ll always have pre-scooped ice cream on hand for my cake slices. Speaking of cake, this homemade vanilla ice cream goes great with this butter pound cake! I hope that you enjoy this classic, homemade vanilla ice cream as much as we do! In a large saucepan over medium-low heat, add heavy cream, whole milk, granulated sugar and light brown sugar. Remove from heat and place mixture in a large bowl. Let cool slightly and stir in vanilla extract & vanilla bean powder. Cover with plastic wrap, being sure the plastic wrap touches the surface of the mixture to prevent the top from developing a skin. Remove from fridge and follow the directions of your ice cream maker. 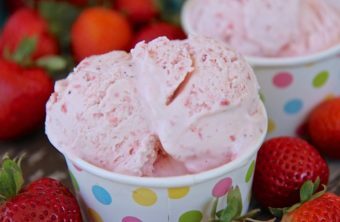 Want more easy homemade ice cream?